"Lanterns From All Nations Make A Brighter World"
The Feast of Lanterns Board of Directors is proud to announce the 2019 theme “Lanterns From All Nations Make A Brighter World.” This year will honor what the Feast has been and illuminate all the amazing community service that the Royal Court and Royal Guard completes during their reign. Our theme for 2019 pays homage to Elmarie Hulbert Hyler Dyke by using her tagline from the late 1950s. The Board of Directors invites you to come and celebrate with the last hometown, Butterfly Town USA. Thank You for helping us celebrate the 113th Anniversary of the Feast of Lanterns and the 60th Anniversary of the Royal Court! 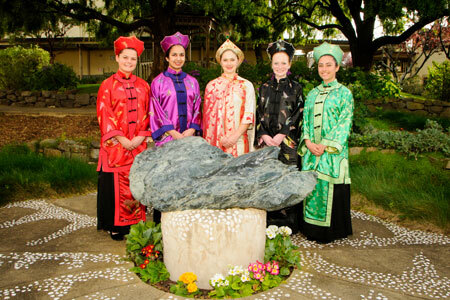 For over one hundred years the citizens of Pacific Grove have celebrated its history and culture with a summer festival called the Feast of Lanterns. This Festival has evolved over its 100-plus year history from the ceremonial end to the Chautauqua Assembly with a lantern parade to the beach and fireworks over the bay to a multi-cultural community event filled with entertainment. Today, with its traditions intact, it continues to provide family entertainment and educational experiences for the community it serves, plus scholarships for community-spirited, active middle school and high school students who are selected each year to reign over the Festival as the Royal Court and Royal Guard. The Royal Court and Royal Guard are selected from applicants by a committee of local business people, former Royal Court members, and Board members based on several factors, including academics, community service, extra curricular school activities and general personal interests. As members of the Royal Court and Royal Guard, the students are instructed in public speaking and the history and culture of their hometown. They participate in community activities throughout their year-long reign. 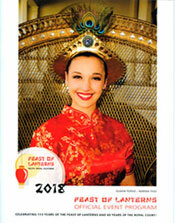 The Feast of Lanterns is a non-profit 501 (c) (3) organization, with an all-volunteer Board of Directors. The proceeds of the festival each year, minus operating expenses, fund an academic scholarship program for the Royal Court and Royal Guard. From left to right: Princess Ruby Ivana Reynolds, Princess Amethyst, Abdhi Jadeja, Queen Topaz, Caroline Coen; Princess Pearl, Cali Knoop, and Princess Emerald, Noor Benny. Visit our Calendar page for a listing of events. 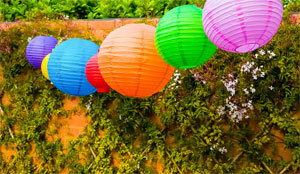 The 4th of July is over: Take down the bunting and put up the lanterns! Entertainment by the Monarch Handbells, Rockstar Dance Studio, the Hootenanny, the 2019 Royal Court and Royal Guard. The Mayor and Queen Topaz cut celebration cakes as we sing happy birthday to our beloved hometown. The Hootenanny will lead a hometown sing along as we celebrate the Feast of Lanterns and the Chautauqua Assembly. Dance the night away with the Royal Court and Royal Guard! DJ Chris spins a hometown dance party for all ages. The event will open 30 minutes early (5:30 pm) for families that have kids with special needs so that they can meet the Royal Court and Royal Guard. Dress up your favorite pet, stuffed or imaginary animal and join the Pet Parade. The 2018 Royal Court and Royal Guard distribute ribbons to participants. They lead the parade in the antique fire truck, followed by dressed up animals and their owners. Following the parade, the PG Recreation Department staff hands out ice cream treats. The big day is July 27, 2019 at Lovers Point Park. Come and witness the heroic journey and transformative power of true love! 10:00 am - 11:15 am - Yoga with the Royal Court - Grassy Area - Please bring your own mat. The Feast of Lanterns Pageant will be the official closing ceremony as it was for the first Chautauqua Assembly, 1905. Please answer a few question about the Feast-of-Lanterns. Your name will be entered in a drawing for 4 seats in our VIP section. For all of those who missed the Feast of Lanterns, participated in the Feast, or have never experienced the Feast of Lanterns - Pacific Grove, CA, we present the HIGH DEFINITION version of the Live Stream of the Opening Ceremonies and the Pageant. Entertainment by the Monarch Handbells, Rockstar Dance Studio, the Hootenanny, the 2018 Royal Court and Royal Guard. Mayor Bill Kampe and Queen Topaz cut celebration cakes as we sing happy birthday to our beloved hometown. The Hootenanny will lead a hometown sing along as we celebrate the Feast of Lanterns and the Chautauqua Assembly. Witness the heroic journey and transformative power of true love! 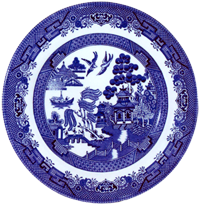 No one knows who first told the story of the "Blue Willow". Perhaps it was a Chinese storyteller who began telling the tale of Chang and his love for the beautiful Koong-se, and how they flew away as immortal doves, forever free. The Pacific Grove version was first told by Pauline Benton of the Red Gate Shadow Players in 1958 at Pacific Grove's Methodist Church - where the lovers fly away as Monarch Butterflies to return again every fall. Long ago in far off Cathay, a land now called China, there lived during the reign of Emperors a wealthy Mandarin named T'so Ling. His land holdings were vast and fertile, and his treasures beyond counting. His palace was built of fine woods and rich lacquers with a roof of blue tile that gleamed in the sun, and a handmade fence that ran below the palace. Behind the palace grew an orange tree, and beside the palace ran a river with a graceful willow that gave shade in the heat of the day. Of all T'so Ling's possessions, his beautiful Princess daughters with their jewel names were his greatest joy. Princess Emerald, Princess Turquoise, Princess Tourmaline and Princess Amethyst. The Mandarin delighted most in his eldest daughter, Koong-se, who he named Queen Topaz, so named for the golden lights that danced in her eyes. This means that she is enlightened and the hero of our story. Topaz passed her days in a summerhouse that leaned over the rippling water, where she did elegant embroidery on silk while listening to tales of old Cathay as told by her faithful nurse, Chun Soy. 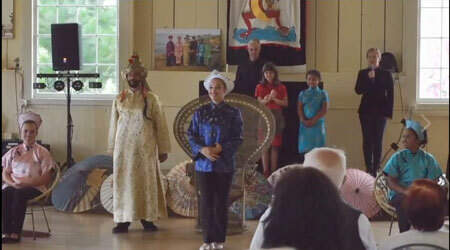 T'so Ling thought Topaz so lovely that he wished to crown her as Queen. A coronation ceremony was planned, and all the princes, potentates, maharajahs and lords of the realm were invited to attend the coronation. One of the old mandarins named Ta-Jin brought a chest of gold so impressive that T'so Ling thought this rich man would make a fine husband for his daughter Topaz. T'so Ling made plans to combine the coronation with a marriage feast. Topaz heard this news and became quite despondent, for she had fallen in love with a young scholar named Chang. Hearing of this, T'so Ling forbade his daughter to marry Scholar Chang. Topaz is heartbroken. One day she is kneeling by the water near the summer house when she sees a coconut shell. In the shell is a note from Scholar Chang and she is so excited that she writes to him, asking him to rescue her from the wedding. Scholar Chang sneaks into the palace on the night of the coronation with the help of the Royal Guard and rescues his beloved. The old nurse discovers the lovers and warns the Mandarin. He chases the young lovers, but they escape. 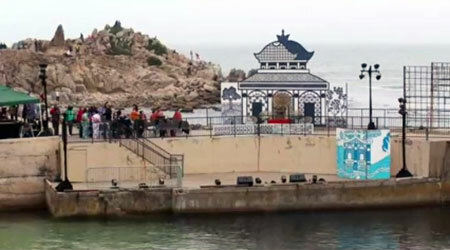 T'so Ling alerted the villagers to search for Topaz and Chang with lighted boats and lanterns. He also orders the great torii gates to be lighted. He wants to find his beautiful daughter Koong-se. All this time the Goddess Guan Yin, has been watching the Topaz and Chang. She is moved by their love. Guan Yin, is “she who hears the cries of the world.” She is the Goddess of Compassion. She decides to transform the lovers, so they might be free. In a final burst of lights, Topaz and Chang are illuminated as they changed into Monarch butterflies and escaped into the sky. The lovers return every year to the place where they fell in love. They are lost in the sea of Monarchs so that the Mandarin may never find them. The pageant, which takes place on the last night of the Festival, tells the story in pantomime and ends with a burst of fireworks overhead as the lovers are seen for a brief moment departing in the guise of Monarch butterflies. Queen Topaz is free to spend eternity with her chosen beloved Scholar Chang.